A lot of thought put into new chess pieces; not enough put toward PC gaming. Also, kinda pricey. You've seen specialty chess sets before: maybe a Civil War set, where the pieces are soldiers, or a Star Wars set with Darth Vader as king. But what if the soldiers could fire their cannons and Vader could use Force powers during the game? Chess 2: The Sequel adds five new sets of chess pieces that don't just look a little different, they act a little different. With teleporting ghosts, rampaging elephants, and a few extra kings, it's the same chessboard but a new kind of war. First, rest assured that the primary tenet of chess is still intact. A checkmate—where a player threatens to capture their opponent's king while leaving him no way to escape the threat—still wins. There's another way to win in Chess 2, however: by moving your king across the middle of the board, known as a midline invasion. Considering it's only four squares to the middle of the board, a midline invasion almost always decides the winner in Chess 2, though I have seen an occasional checkmate. In addition to the original chess set, which functions as normal, there are five new sets, each with their own unique pieces and rules. The Animals set features an elephant (instead of a rook) that can trample three squares full of pieces at once (including friendly pieces, if they're in the way), and a tiger (in place of a bishop) that retreats after capturing an enemy. There's a set with no queen but two kings who get an extra move each round and can launch special multi-square attacks, though both need to cross the midline to win. There's the Empowered set: bishops, knights, and rooks, when next sitting to each other, can copy the movement style of one another, making them extremely difficult to defend against. There's also the Nemesis set, with a Queen that can only be captured by an enemy king, making her more dangerous than ever. My personal favorite is the Reaper set, which has two ghost pieces that can teleport to any open square. They can't capture pieces, but they also can't be captured, making them great at simply blocking other pieces from moving. A brick wall or two can be pretty useful on a chessboard. Any of these new sets can play against any other. You pick your army without knowing what your online opponent is picking, so you could wind up with a Two Kings set against a Nemesis, a Reaper set against Animals, two Empowered sets squaring off, or any other combination, including the vanilla set. This means you'll have to keep your set's rules in mind while defending against the rules of your opponent's set. It's unbalanced as hell, of course, but if you wanted balanced you'd be playing regular, elegant, utterly perfect 1,500 year-old chess, right? Adding some time to matches, but not much fun, are duels. When a piece is captured, the defender can instigate a duel, meaning each side bids between zero and two stones (each player begins the game with three stones and capturing pawns gives you additional stones). 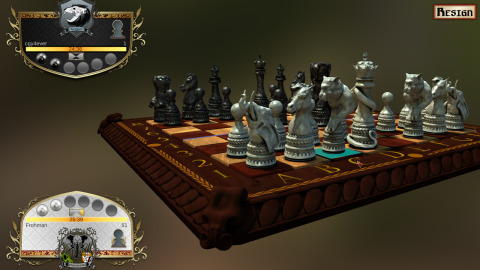 No matter who wins, the defending piece is removed from the board, but if the defender bids higher, the attacker is also removed. This adds a little strategy, but it also slows everything down, and in a game with teleporting ghosts and stampeding elephants, quick matches are the best ones. There is apparently a challenge mode on the way, where you'll be able to invite a friend to play, but at the moment it's only random matches with strangers, and matchmaking leaves a lot to be desired. At times I've been unable to find a match at all, while other times I've picked my team, gotten no response from the other player, and been booted back to the menu after 30 seconds. There's no communication at all between opponents, nor is there a lobby to chat in. A simple rematch button so you could keep playing with the same opponent? Nope. You're bounced back to the menu after every single match. And here's a big issue: there are literally no settings for this game. Where there should be two volume sliders, one for music and one for sound effects, there are instead zero volume sliders. There's no choice of resolution, nor even an option to play in a window. There's no way to take a quick peek at the rules during a match if you've forgotten how a particular piece or set works, and most of the new pieces don't look particularly distinct, making it hard to associate them with their new moves. And, even when you aren't in a match, there's no way to read about one specific set without cycling through all of the game's rules a page at a time. It's about as inconvenient a setup as you could imagine. It doesn't stop there. During practice sessions, there's no way to select the A.I. 's choice of chess set, which is truly baffling. If you want to play a Nemesis army against Two Kings, for example, you'll just have to hope for the A.I. to pick it randomly, or keep resigning and restarting until you get the match you want. There's not even an option to adjust the A.I. 's skill level to match your own, so if you find it too challenging, or not challenging enough, there's nothing you can do. I've had some good matches in Chess 2, and most of the new sets are interesting to learn and fun to play with, but with no options or settings, a vague matchmaking system, a needlessly restrictive practice mode, and no multiplayer lobby or chat—you know, the very basic things PC games should have—the $25/£19 price tag feels way too steep.